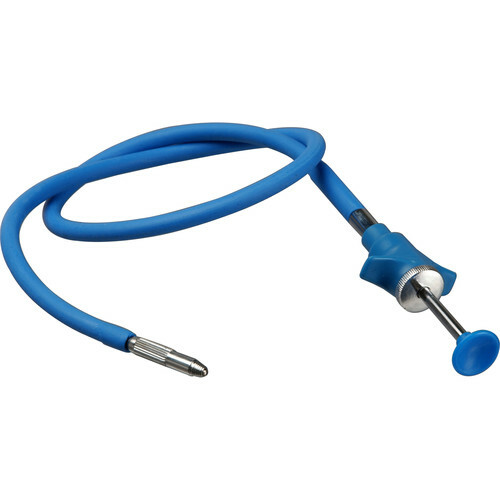 Trigger your camera's shutter without adding any unwanted shake by using this 40" long blue PVC Pro Threaded Cable Release from Gepe. Designed to work with any camera featuring a standard threaded release, this cable release also features a disk lock that will make it easier to take long exposures. Additionally, it has a PVC covering for protection. Box Dimensions (LxWxH) 7.0 x 5.0 x 1.5"
PVC Pro Threaded Cable Release with Disc Lock (40", Blue) is rated 4.8 out of 5 by 5. Rated 5 out of 5 by Anonymous from Excellent Product!!! I use this product on the 4x5 camera for Toyo and works great. Doesn't fit very well, but it still works with no problems. It is long enough to use and your not restricted in using it in a limited place, plenty of room to move around with it. I would definitely buy this product because of it durability and its length. Not bad for the price and it will last. Rated 5 out of 5 by Leswick from This cable release rocks. I bought it specifically for 4x5 rig. Smooth operation, bla bla...it does what it suppose to. No nega comments. Rated 4 out of 5 by John from Best one Best release I ever had. I wear out every one I use, this one appears better made than all the rest of them. Rated 5 out of 5 by Zach from Great German-mad product I just got this for Christmas after using a cable release that I broke a few months back. The length is nice, I drape if over the lens when I am not using it, where as shorter releases just sit there. I use this with my Nikon FM3a and FE, as well as with my Mamiya C330 and Rz67. Great product that is made to last. Another great thing about the length is I can take selfies with friends and a wide angle lens. Hi, does this work with Linhof Technika? Yes, works with Copal shutters on Linhof cameras. Hi. Will it work with X pro2? No, the X-Pro2 uses an electronic release not a mechanical shutter release cord.This is one, Fujifilm RR-90 Remote Release B&amp;H # FURR90 MFR # 16394611. Would this work with a Canon AE-1? How long is the throw with this, i.e. how much comes out when you press it all the way down? I have two cameras that require a particularly long throw. Thanks!